In Saskatchewan, there are dozens of public roadside attractions that are points of pride for their communities — the world's largest coffee pot and cup in Davidson, and the red paper-clip in Kipling, among dozens of other sculptures across the province. The objective of Roadside Attractions, when it was first conceived in collaboration between the Dunlop Art Gallery and project partners, was to provide small communities and larger city centres with public contemporary art by leading artists from Saskatchewan and across Canada. The intention was to create a temporary network of contemporary art works that would expand citizen and visitor understandings of what public art could be. The project also provided an opportunity for the invited artists to create public art works that responded to the province’s history, people, and land. For many of the artists who participated in the project, Roadside Attractions represented their first opportunity to create public art, and their first opportunity to show in the province of Saskatchewan. Canada’s vast geography positions our national identity around our regions and provinces. The vastness of our country is particularly evident when one drives around Saskatchewan, with the flat, seemingly endless Prairie stretching to make moments in time feel like longer than they really are, in magical and monotonous ways. Driving is a required part of Saskatchewan life, as the diffuse nature of the province demands long road trips between smaller communities, and between the province’s two major centres — Regina and Saskatchewan — where many of the Roadside Attractions projects are situated. The requirement of a vehicle to move around the province was made even more evident in 2017 (a time after Roadside Attractions was proposed to the Canada Council for the Arts’ New Chapter program), when the Saskatchewan Party government cut funding to public transit and public libraries. While the funding to public libraries was later restored, the STC was not, leaving many Saskatchewan residents without reliable access to transit — something which changed the conceptual shape of this project, as access was not initially such an issue to consider. The initial path for Roadside Attractions could have been accessed via Saskatchewan Transportation Company routes. The dismantling of STC made a vehicle a requirement to experience the works on Treaty 4 and 6 territories, as opposed to an option. The identities of people who live or grew up in Saskatchewan on Treaty 4, 6 and, 10 territories are indelibly shaped both by its history and landscape. Artist Joi T. Arcand’s text-based installation works commissioned by the Moose Jaw Museum and Art Gallery, for example, use Cree language and words by Darryl Chamakese of Chitek Lake to speak to the sacred promises of Treaty, and express the ways in which waters and the land are inseparable from the body. The rolling plains and farmlands that make up the southern geography and are the stereotypical picture of the province to the rest of Canada make an appearance in some Roadside Attractions pieces, like Atlantic artist Eleanor King’s murals in Langham, painted with aerial views of the Prairies that fuse the painterly and abstract styles of Saskatchewan painters Dorothy Knowles and William Perehudoff. But the people who live and travel around Saskatchewan know that the land that we drive on, and sometimes fly over, is quite varied, with the shield’s boreal forests and lakes to the north, and the badlands further south. While Roadside Attractions projects are admittedly largely situated on the Prairie portions of our landscape, there are several projects that edge on to the Northern portions of our province. In Prince Albert, Saskatchewan artists Heather Benning and Tim Moore (now based in Swift Current) collaborated on Rearview Mirror, a sculpture located at the Mann Art Gallery. Benning and Moore’s work, in the shape of the titular mirror, is hugely oversized (like many of Saskatchewan’s attractions), while the elements painted, collaged, and beaded into the woodgrain of the sculpture flow from each artists’ experiences and impressions of what it means to choose a place to live in — in their case, the province of Saskatchewan. Saskatchewan is a place where many people who are born and raised here eventually leave in search of other opportunities in larger cities. The work seems to suggest that to truly choose a place (like Benning and Moore have), requires several variables to align — a desire to stay strongly tied to one’s culture and family, and a yearning to return for our geography and seasons. The boom and bust of our Prairie economy, largely resource-based, makes for unstable financial (and political) times. To choose to live in Saskatchewan with its sparse population, in some ways is a radical gesture, particularly if one is choosing a career in a field such as the fine arts, where there are often more varied opportunities elsewhere in Canada. Looking back, as Rearview Mirror suggests, people who have left Saskatchewan have the choice to view it in a few different ways — through rose-coloured glasses and a yearning to return, or a rejection of the place by focusing on the more challenging aspects of life in the Prairies. British Columbia-based artist Babak Golkar’s Made In Canada (2018) resembles a green and white highway road sign, also referencing the driving element of the Saskatchewan-wide project. 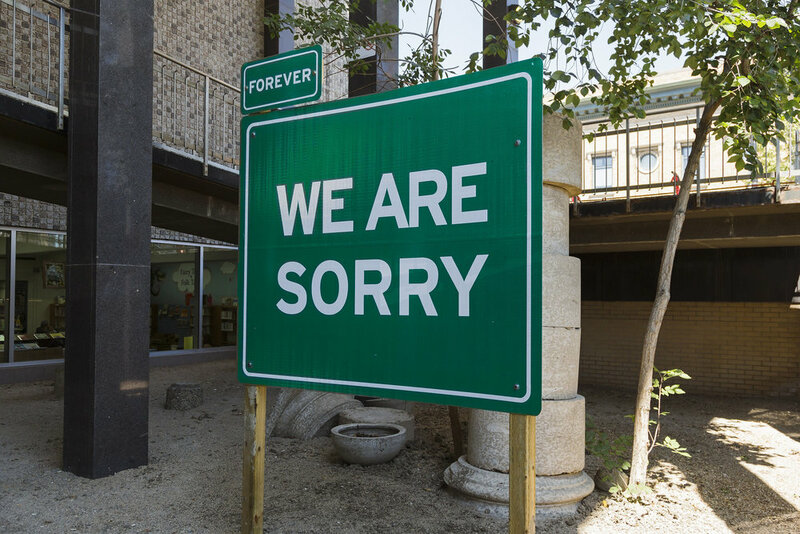 Spelling out ‘WE ARE SORRY’ in large upper-case letters, with a tab which in a much smaller type, spells out “FOREVER”, the work connects with the stereotype of the Canadian as an apologist. It’s also a universal phrase which Golkar notes “never gets old” and can become “devoid of meaning very easily”, particularly in a political context. Although the subject and object of Golkar’s apology in the case of this work is vague — who is the ‘we’ and who is being apologized to is purposefully ambiguous — Golkar’s use of the aesthetic of the highway sign as context for the message could suggest that the apology is meant to be seen as coming from an authority such as a government agency. The genuineness of the apology is also suspect. The additional tab on the sign which states that the apology is ‘forever’ indicates that apart from the apologies of the past, the apologist sees that their future activities will also require apologies, potentially infinitely. Golkar’s piece was originally intended for installation in Blaine Lake, Saskatchewan, which could support a reading of the work in a historical context — the government’s mistreatment of Canada’s Dukhobor population, who had a settlement in the area. In 1907, for example, the Canadian government reneged on an earlier promise that Dukhobor newcomers exiled from Russia for their religious and cultural beliefs during the 1890s could live and work in colonies in Alberta, British Columbia, and Saskatchewan. The federal government continued to be suspicious of the Dukhobors because of their different belief systems: their opposition to militarism, their refusal to send their children to school, and their desire to maintain their language. Consideration of context is essential to Golkar’s art practise and is critical in this case given that his piece, like other Roadside Attractions art works, was funded in part by the New Chapter Fund, on the occasion of Canada’s 150. Golkar has a background in architecture and design, and in 2006, he worked with a similar phrase to create a poster series. Like Divya Mehra’s work, at first glance, Golkar’s works can seem quite playful, but once his work is contemplated more deeply, the potency of the politics in his works can more strongly emerge. The city of Weyburn, Saskatchewan, is home to one of the province’s fastest-growing newcomer populations, with many newcomers settling in Saskatchewan through the Provincial Nominee Program, where applications are fast-tracked by the Canadian government. For Roadside Attractions, Manitoba-born artist Divya Mehra considered, in part, Weyburn’s growing newcomer population by making a publicly available artist multiple (in an unconventional twist on the idea of public art), that is available for the price of a cup of coffee at two popular driving stops in town. This multiple took the form of two sets of limited edition coffee mugs, with a project titled World Famous, Come in We’re Open (Thoughts on a Better Tomorrow). 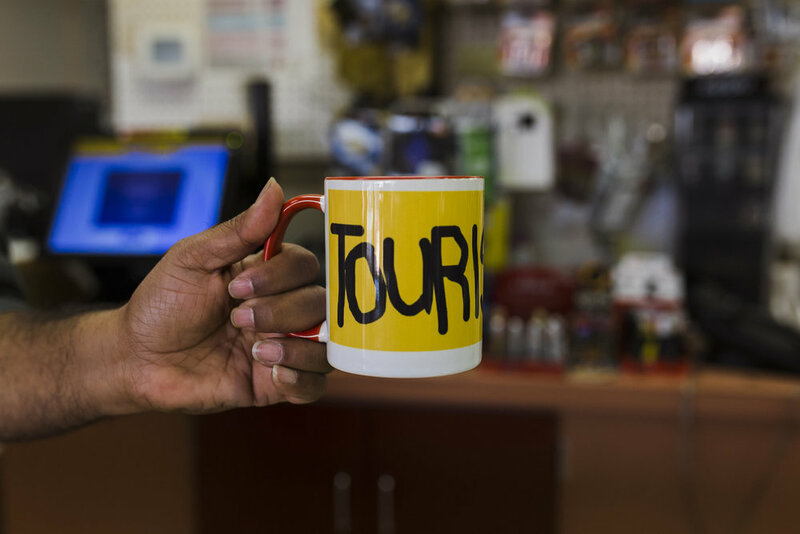 One set of mugs, spelling ‘TOURIST?’ in seemingly hand-written, uppercase black letters on a yellow background that wraps around the cup, could be read on several levels. 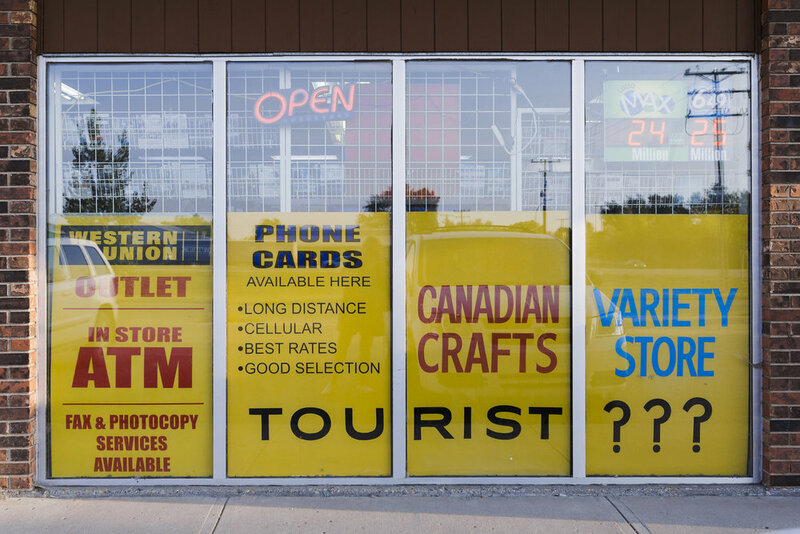 At first glance, it seems to visually mimic and repeat some of the signage used by Zippy Mart, where the mug is available: a bright yellow sign in front of the store offers long distance phone cards and other items that might be useful for someone travelling through, with the word ‘TOURIST?? ?’ stretching across the bottom. A lighter read of the work could be that the piece acknowledges the people that pass through Saskatchewan who might not live there, or even Mehra herself, as an artist contemplating her own relationship with Weyburn as a non-Saskatchewan artist. 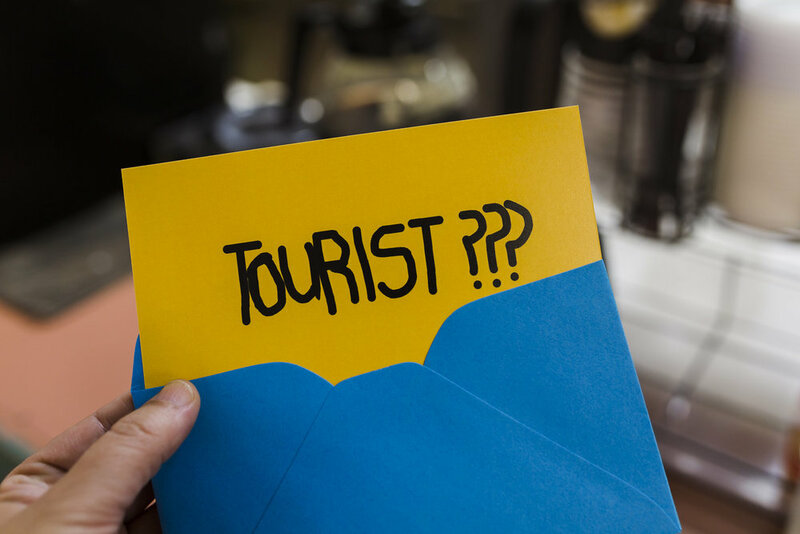 TOURIST? could also be read as an indictment of racist views some Canadians hold around newcomers, particularly people of colour who have immigrated here in search of a new opportunities and dedicate themselves to their new communities — a situation particularly true in Weyburn, which heralds itself as “The City of Opportunity”. On another level, like Golkar’s work, it could also be seen to contend with Canada’s colonialist history, reminding settlers and newcomers alike that in a sense, everyone who has come here from another place is settling on Indigenous territory, and we are all in some sense, tourists. This final reading of the work is reinforced by the second set of editioned mugs Mehra has produced, which reads ‘ALTERED STATES’ in black uppercase text on a red background, and available at Main Track Cafe. A lighter reading of the work could refer to the states of exhaustion some drivers must feel as they move across the country — particularly the Prairies, which are notoriously boring once one has stopped reveling at the wonder of the wide, giant skies. Another reading of this work could be a consideration of the ways in which newcomers to Canada have changed and shaped their lives and communities through their presence. As Mehra is known for making work that is critical of colonization and investigates institutional racism using a variety of media, often referencing pop culture and current affairs, even the yellow and red colours used to decorate the interiors and exteriors of both sets of mugs can also be read on two levels. On a lighter level, the yellow and red colours can be seen to echo the branding of many fast food establishments (particularly McDonalds). But on another level, they could be read as further commentary on race — a frequent theme Mehra explores in her work — potentially referencing the possibly well-intentioned but cringe-worthy song “red and yellow, black and white, they are precious in his sight”, lyrics that would be familiar to many older, Christian-raised Canadians who were taught these words at Sunday School or church as a lesson in tolerance. The phrase ALTERED STATES could also be interpreted a reference to Weyburn’s history, as the city is internationally recognized for its mental hospital and their legacy of LSD research and experimentation in the 1950s. Just as Mehra’s work considers the impact of newcomers on the Canadian Prairies, Montreal artist Karen Tam’s work also looks at under-examined newcomer experiences on the Canadian landscape. Throughout her practise, Tam has returned to the Chinese restaurant as a site to explore the discrimination, family histories, and hardships of Chinese-Canadians, something which ties into her own family history, as the daughter of parents who owned and operated a Chinese restaurant in Montreal. Twelve years ago, as part of another project Tam was working on in Saskatchewan, Tam encountered a story about a businessman who owned and operated a Chinese restaurant in Moose Jaw. The business owner, Quong Wing, had hired two white female servers prior to the passing of a piece of 1912 Saskatchewan legislation — the ‘white woman’s labour law’ — which prohibited white Canadian women from being employed by ‘Chinamen’. Despite his status as a naturalized Canadian citizen, Quong was prosecuted for his continued employment of the servers after the legislation came into effect — an example of how Canada, through its creation and enforcement of provincial and federal laws, legally entrenched and enforced institutionalized racism (the law was only repealed in 1969). Tam produced a paper cutout inspired by her research, and perceives the work produced for Roadside Attractions as a continuation of this project. Blood and Tears, situated in Birch Hills, likewise considers a less-discussed history of the Prairies and their people — the connections between a Chinese-Canadian citizen based in Victoria who owned and operated several Chinese restaurants and cafés across the Prairies between the 1930s and 1950s, and his business associates across Saskatchewan, who ranged from restaurant operators to employees. Tam frames her research and the resulting work she has produced — a three-panel, heavy bronze screen installed in front of Birch Hills’ town hall — as a ‘counter-archive’ and act of resistance to consider “what has been erased, left, out, and interpreted in public and dominant histories.” The bronze screens also bear the names of many of the restaurants and cafes throughout Saskatchewan that were connected. Significantly, their names attempt to indicate connections with a Western (versus Eastern) history, like “Paris Café”, “Elite Café”, “Venus Café”, “Maple Leaf Café” and “Empire Café” as some examples — names which might sound more neutral to the settler Canadians in the communities these restaurants were a part of. Tam conducted her research for the project by looking through business directories and telephone books from the 1950s, as these kinds of histories are typically omitted from more traditional archives and are not considered a part of many Saskatchewan’s communities shared and discussed histories. Although Tam had intended to include a list of Chinese restaurants that were situated in Birch Hills as part of her project, she was unable to do so because the business directories she uncovered were not clear about which businesses in the city would have been Chinese-Canadian owned and operated, and there was nothing she could find in the history of Birch Hills that captured early Chinese-Canadian experiences in the city. The project connects to Tam’s body of work as an artist, as the themes she deals with in her work primarily connect the perception of Chinese-Canadians by other Canadians. 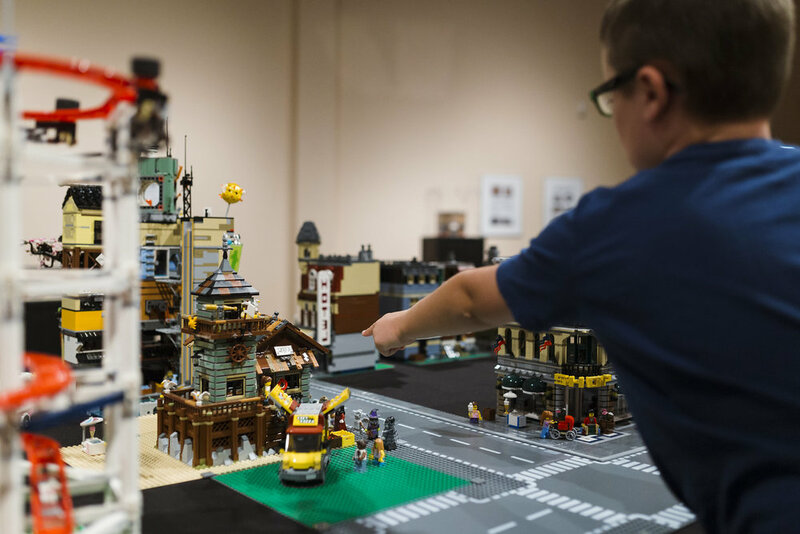 Several works for Roadside Attractions have a more whimsical spin, referencing the Saskatchewan interest in creating sculptural versions of everyday objects — pieces like Alison Norlen’s oversized ice cream cone, commissioned by the Estevan Art Gallery and Museum (referencing Estevan’s history as home to the first Dairy Queens in Saskatchewan) and Kelly Litzenberger’s crowd-pleasing Lego replica of Yorkton at the Godfrey Dean Gallery. For his work in Melfort, Ontario-born, BC-based Justin Langlois turned to living history and engaged people in the community to create text-based signage works. Langlois is known for his socially engaged art projects, where through conversations with citizens, he investigates how people feel about their communities, and works with them using a variety of relational strategies to help them envision futures for their communities. Following this practise of using conversation and story-telling to centre place-making, Langlois worked throughout 2017 and 2018 with Melfort citizens to designate places in the community as unique, audience-driven community attractions — places the people of Melfort appreciate and value. 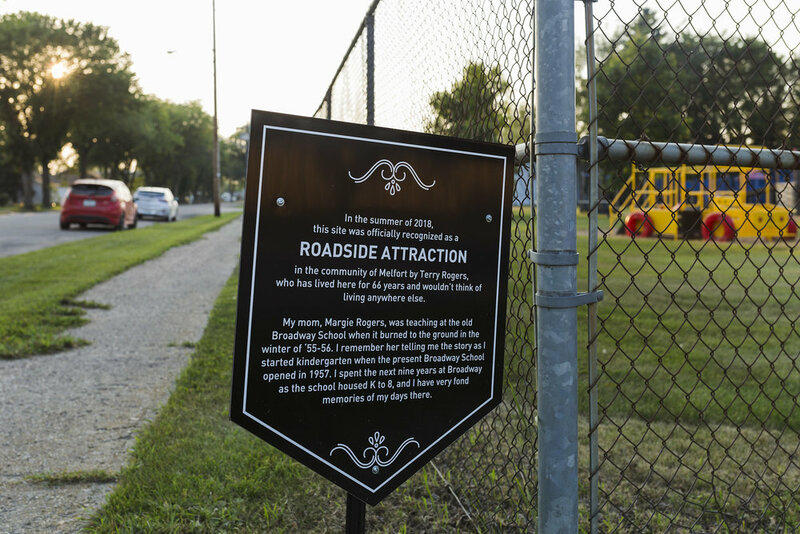 The 20 markers, which identify a range of attractions from public parks to local businesses and places of worship, all express an appreciation for Melfort’s history and past and present citizens, acknowledging how each attraction contributes to the vibrancy and significance of the community. The markers, designed by Langlois and printed by a local Melfort business, have a somewhat official appearance in their layout and positioning, while the actual material of the signs and their installation suggest something more provisional and temporary as opposed to permanent, like a flag pennant — an unusual quality for a historical marker. Langlois’ interest in text as an art medium, in this project, as in past projects, makes his work more accessible to a general audience. As the artist has noted in interviews, text is not traditionally thought of as an ‘art’ medium, so becomes an accessible entry point to a work, particularly for people who sometimes might feel intimidated by looking at, or thinking about, contemporary art. There is something altruistic in Langlois’ gesture to invite citizens to draw attention to important sites that might otherwise be overlooked or become a background for people’s lives. Asking townspeople to stop, look, appreciate, and share what they value in their community allows for a moment for people to consider and celebrate what is special about where they have chosen to live. In one sense, the relational nature of Langlois’ project is almost time-based, as the work unfolds and is experienced, like Roadside Attractions, in relation to the journeying that is required to experience all of the elements of the project. Artist Ruth Cuthand, who resides on Treaty 6 territory and is of Plains Cree, Scottish, and Irish ancestry, acquired an interest in the visual culture of disease at an early age, when she was regularly tested for tuberculosis as a child growing up in Cardston Alberta near the Blood Reserve. For Roadside Attractions, Cuthand, like Tam, wanted to research and make work about a little-discussed history in Saskatchewan — the first outbreak of smallpox in Western Canada, which took place in Cumberland House in the late 1700s. Cumberland House, a community in Northern Saskatchewan, was founded 8 years before the smallpox epidemic broke out. Unlike many outbreaks in Canada, this outbreak was unique in that it was extremely well-documented. Hudson Bay Company workers William Tomison and Matthew Cocking, originally from Scotland, identified the illness almost immediately and sought to contain the outbreak by seeing that the sick were quarantined in the Hudson Bay headquarters, nursed, and fed. Their account remains among the first records of an epidemic among Indigenous people. Wanting to share this history with the younger generations living in Cumberland House, Cuthand worked with the nearly 300 students studying history and science at the community school to tell them stories about what happened there, and created a large static window cling that depicts the smallpox virus rendered in beadwork. To communicate how the disease spread, Cuthand installed the large ‘mother’ smallpox in the science room window and then distributed 300 smaller window clings to the students, which they brought home to proudly display in the windows of their homes. To further her research, Cuthand worked with the Cumberland House band office to try to locate where the bodies of smallpox victims would have been buried, only to learn that the site of the original band office was haunted, something which made sense given that a few years after the band office was built and more work was being done on the property, skeletons were found — likely the remains of the smallpox victims that Cuthand was hoping to locate. It is interesting that, like Tam, Cuthand opted to create work that resulted in sharing a not-particularly well-known or discussed history of Saskatchewan — a history that is important, but because it impacted Indigenous populations and is not a primarily white settler narrative, is not considered one of the more significant stories of the province. It is also significant that Cuthand chose to work on a site that is far off the driving path of the Roadside Attractions journey but situated in the space of the event’s historical occurrence, delivered directly to the audience for whom the piece is most relevant. It speaks to the importance of place and location, and how important the dimensions of people, history, and place are to a work, such that it requires a full gravitation to the original site. When Montreal-based artist Vicky Sabourin first encountered the Prairie landscape of Montmartre via Google Street View, she was stunned by its flatness. Her visceral reaction to the land became the foundation for her sculptural text piece ‘The Absent Mountain Is My Aching Phantom Limb’, which, like other text works in Roadside Attractions, can be interpreted in many ways. Sabourin’s initial reaction to the flatness of the landscape was to build a mountain (if only metaphorically). Although, to Sabourin, the gesture felt cliché, it was a drive too powerful for her to escape. Installed adjacent to the community’s scale replica of the Eiffel Tower, Sabourin’s work created for Montmartre is also tied to Sabourin’s imagined reaction of the French settlers. Sabourin wonders if those who left France for Saskatchewan and were stunned, as she was, by the difference in the horizon line from their homeland and saddened by the emotional weight of the friends, family, and items they had to leave behind. The presence of the word ‘limb’ in Sabourin’s selected phrase ties to a connected piece of Franco-Canada and Franco-Saskatchewan history — the cross-country argument around who owned the remains of Édouard Beaupré, a man with Métis ancestry, and one of the tallest recorded men in history. Born in southern Saskatchewan in 1881, Beaupré went on to work for several circuses until the time of his death, after which his remains circulated for public display, largely in Quebec, until his family successfully fought to have his remains returned to his hometown in Willow Bunch eighty-six years after his death. Sabourin was surprised to hear that this specter of her youth in Quebec, who she sang about in folk songs, had ties to Southern Saskatchewan. In part, Sabourin imagines her work as a kind of monument to Beaupré, finding threads between her francophone ancestry with her new understanding of both Saskatchewan and Quebec by studying parts of their histories that were new to her. As with other works in Roadside Attractions, Couzyn van Heuvelen’s artwork Nets considers Saskatchewan and Canada’s colonialist history, but his piece for the project is also focused on Indigenous histories and ways of working with and knowing the land. As an Inuk sculptor, fishing practises are an important part of van Heuvelen’s life experiences. Fishing has become a recurring theme in his work, as many of his recent major public art installations have included meaningfully sculpted oversized fishing lures. Nets features sculptures of fish caught in chain link fencing — fencing made to look like nets with the addition of the fish and a series of blue and wide buoys strung across the tops. With the work installed in Fort Qu’Appelle, van Heuvelen uses the fish and nets to reference the nearby fishing lakes, which would have been historically important to the Indigenous people on Treaty 4 — bands such as the Cree, Saulteaux, and Assiniboine, signatories on the 1874 agreement signed in Fort Qu’Appelle. The lakes also would have been important to settlers on the territory, settlers who likely marked their properties with fences and other divisions as a colonialist strategy. The work is installed within visual distance of Fort Qu’Appelle’s Hudson’s Bay Company 1897 downtown storefront. Fort Qu’Appelle-born, Saulteaux artist Mary Longman’s piece for Roadside Attractions is also inspired by her Indigenous ways of living on the land. Her twelve-foot high firestarter sculpture with large cross-post, installed at Wanuskewin Heritage Park, also speaks to Indigenous traditions. The sculpture’s stones that circle around the wooden components of the sculpture help it act as a timekeeper and provide a place for people to sit and gather. Several works in Roadside Attractions work with Saskatchewan’s natural environment. Pieces like Laura St. Pierre’s striking video installation, commissioned by PAVED Arts and featuring video projections of carefully collected and preserved flora specimens from Jan Lake, SK, reveal the fragility of our familiar landscapes. Sean Whalley’s sculptures, made from branches and twigs over steel armatures and situated in a public park in Regina, propose different ways we might shape urban space by embracing the cycles of nature and the fauna who rely on old materials and dead fall. Kara Uzelman’s outdoor sculptural installation, situated on a walking path at Last Mountain Lake National Wildlife Area and Migratory Bird Sanctuary, replicates natural phenomena and deals with land, utilizing found objects, a theme common throughout her practise. The artwork emerged from her site-specific experience of contemplatively walking the path and engaging with the landscape and its history, and by walking and engaging with the land and history of her place of residence, Nokomis. With each walk, Uzelman would find different elements and pieces of the land and found objects that she connected with, sometimes taking pieces of what she found back to her studio to replicate (where the title of her work, Borrowed, is somewhat derived from — borrow, meaning earth that is taken from an existing site and used for fill material in projects such as road building and maintenance). Elements in the landscape she sought to replicate included lichen, bison rubbing stones, field stones, and even subtle geographies, such as dips and depressions in the ground. Uzelman also engaged with historical accounts of the area, reading old maps and stories written by the settler visitors to the area in the late 1800s that recorded their impressions of the land, a history that was significant to study given that Last Mountain Lake was the first bird sanctuary established in North America. Uzelman worked on her sculptures as the Saskatchewan snow fell and melted, each moment in the season revealing new details for her to contemplate about her chosen site’s landscape and its natural (and unnatural) history. Her final installation, comprised of sculptural replicas of items she encountered and was drawn to, are placed in a circular configuration at a midway point on one of the bird-watching paths. The installation is most easily found when one uses the maps Uzelman has prepared that are available for pick up at the information kiosk, making the journey feel a bit like following a treasure map. While the field stone pieces of the installation (and even the potash and clay) initially blend seamlessly into the landscape, after a few moments of looking, they stand out when other, more unnatural elements in the installation emerge, like a partial cow skeleton, leftover seed potatoes and a crushed glass beer bottle. The installation is striking for how detailed and perfect Uzelman’s replicas are. (I felt very guilty when I turned over one of her sculptural rock to see if it was truly an art work and could not believe it wasn’t the real thing.) In a strange and wonderful way, Uzelman’s installation is a microcosm for the Roadside Attractions project — a journey (if a much, much shorter one!) through a sometimes void landscape to arrive at something that is artist-made, and potentially unnatural addition to the location, but an addition that is mindful of that location’s history and people and engaged with what happened in the province pre- and post-settlement. Yet Uzelman’s piece is very different given its situation in a location where large stretches of natural grassland grow — an ecosystem that is becoming increasingly threatened and has been largely decimated internationally due to human development of land. Many of the artists selected for Roadside Attractions from across Canada, who had never visited the Prairies before, used physical and digital maps — in particularly, Google Maps’ Street View feature — to visualize each community they were working in, and wander down their streets. This confluence of understanding space and place through digital and physical realities is clearly articulated by some works in Roadside Attractions such as the collages of Dominique Petrin, also featured in the Summer 2018 Dunlop Art Gallery exhibition URL:IRL. Conceptions of place were, and continue to be, defined in a colonial context by maps. Art Gallery of Regina-exhibiting artist Barbara Meneley, in her work Cartographies for the Next 150, interrogates cartographic representation, examining how arbitrarily natural conditions can be depicted or characterized into 2D form. 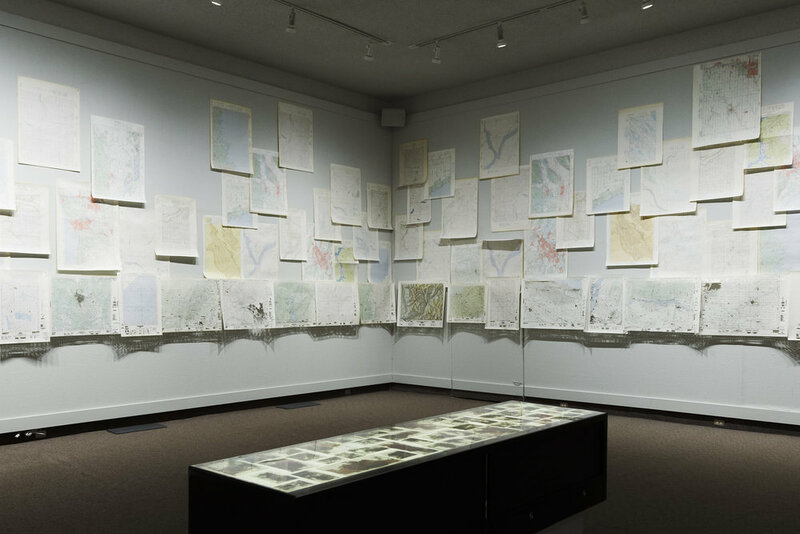 Using national topographic system maps of Treaty 4 and other areas, Meneley delicately slices through sections to edit, remove and ‘unmap’ portions of land, and positions selected portions elsewhere in the gallery — some map segments are placed inside small envelopes placed on top of a small map table in the centre of the gallery space. For Regina-based Meneley, maps support and maintain simplified ideas of land to create a visual picture that can be used for a variety of purposes. Of particular interest to her, as an artist, are the key roles maps played in luring early settlers to Canada from European nations. Maps, history, and the stories we tell about Saskatchewan and Canada inform our identities. Smaller stories do not often get told, and smaller communities, smaller arts and cultural organizations, often go uncelebrated. Not every aspect of Saskatchewan’s history is touched on in Roadside Attractions — there are no art works about the birth of universal health care, the RCMP academy, the trial of Louis Riel and the North-West rebellion, or other stories the province is known for. Roadside Attractions both is, and is not, a project happening in response to Canada’s sesquicentennial, due to it’s timing a year later in 2018, and it’s focus on Saskatchewan’s people, places and histories. The Roadside Attractions art commissions are temporal in every possible sense. They are products of the times in which they were made, and up for a short period. To view every work in the project also makes the experience time-based, with hours lapsing between art work viewings, giving the viewer (driver or passenger) time to discuss and research individual works on display, or listen to the podcast content provided on the project website. The art works are personal and political responses to Saskatchewan and Canada, often using text as an entry point for discussions that extend beyond typical conversations about contemporary art. Travel and new experiences promote self-discovery. Roadside Attractions provided artists and viewers with many opportunities to see their province, country, and themselves, in new ways during the summer of 2018.